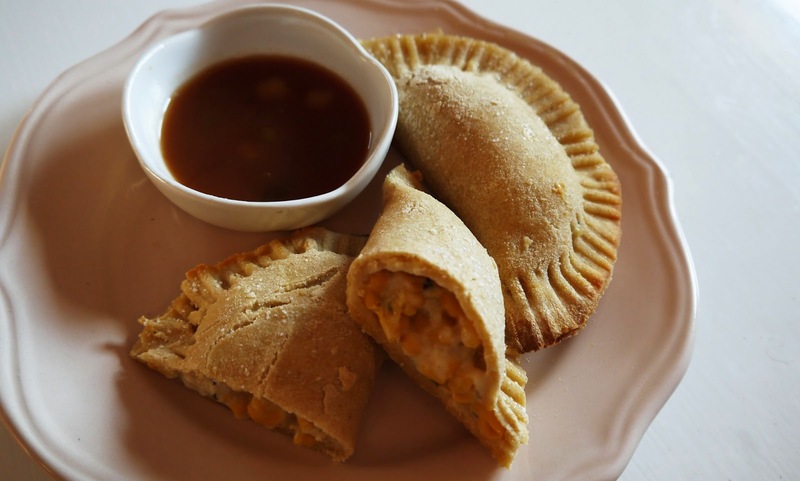 Empanadas are tasty bread pockets with versatile fillings similar to a calzone or panzarotti. They originated in Spain, and recipes were spread around the globe during the colonial period with each nation putting their own twist on the fillings and dough. They can be baked or fried, sweet or savory, a snack or a meal. It all depends on you, and what you feel like. I have experimented with many empanada fillings including, peanut stew from Gambia, vegan bechamel from Argentina, and simple vegetable curries from India. This recipe is for an easy Indian inspired filling which goes wonderfully with a tamarind chutney, or even a cilantro pesto. Prepare the filling in advance as it needs to be cool when you handle it. Our corn and coconut "Agung" empanada that we served at the June Annex Flea. Agung is the name of the largest volcano in Bali and the filling is inspired by Balinese vegetable curry. Line a baking sheet with parchment paper and place the empanadas in rows, making sure they don't touch each other. Bake in a pre-heated oven at 400 degrees F for approximately 25 minutes or until golden brown.